I think it must have been Walt Disney’s “The Jungle Book” that inspired me, although I didn’t know it at the time. Singing along with King Louie the Ape as he swung through ancient ruins, covered by interwoven roots and branches of the enveloping jungle, entertained me as a child and still does so today. It turns out that this place actually exists. It’s all still there in Angkor Wat, including the monkeys. Angkor Wat is Cambodia’s jewel; it is even depicted on their flag. There is less of a ‘discovered in the jungle’ feel to it these days as 4 million visitors a year can confirm. But a visit to the world’s largest religious site, all 400 acres of it, has been hugely rewarding for me. 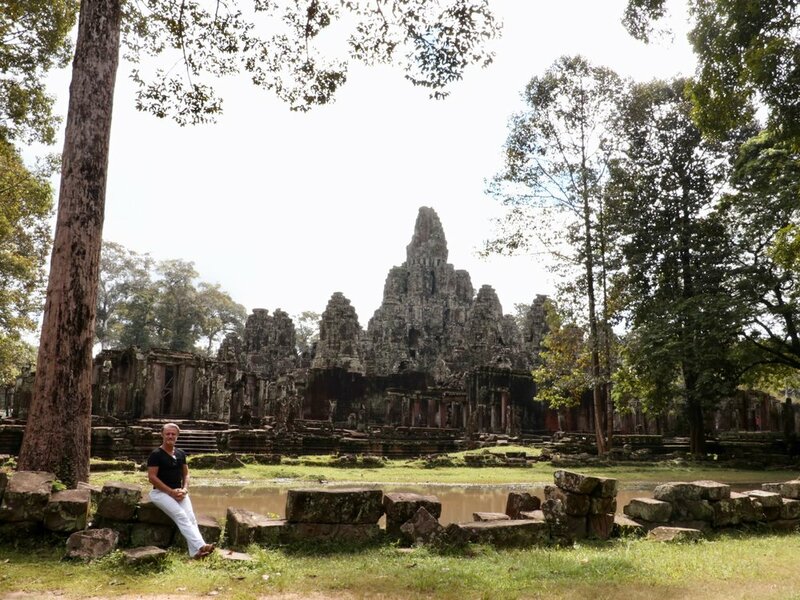 It was built by the Khmer King Suryavarman in the early 12th. Century to worship the Hindu god Vishnu, but gradually became a Buddhist Temple by the end of the century. Angkor means City, and Wat is the Khmer word for Temple. As so often happens with Kingdoms, family arguments followed, neighbours invaded, the empire collapsed, and in this case the jungle swallowed it. Fast forward five hundred years to the 20th Century, and the world started to uncover it again. The Cambodian civil war and other interferences interrupted the recovery between 1970 and the late 80s. That makes it all the more remarkable that so much of it remains in fabulous condition. The bas-relief sandstone friezes show very little sign of wear. You can even see some of the paint / pigment applied in places. Sadly most of the statues have been decapitated and can doubtless be found in museums and private collections around the world. There’s only the odd bullet hole and shell repair evident. There are many Temples in the area but Angkor Wat itself is the best preserved. The centre piece has three rectangular galleries, each raised higher than the other. The highest level has five towers; four in each corner and the largest one in the middle. A mountain-like design. There is a moat and an outer wall. The reliefs show religious events and beliefs, as well as wars and daily life. The faces on the towers are either images of the King himself, or of his guardians. Scholars are divided on the answer, but I liked them anyway. Ta Prohm always makes visitors smile, whether you are a fan of Lara Croft, Indiana Jones or “The Jungle Book”. This late 12th. Century Buddhist Temple complex has been left largely as it was found, except for some steel frames added here and there. Some of the huge trees - one species is called silk-cotton and another is called strangler-fig - engulf the walls with colossal roots both destroying and supporting the stone structures. Their roots remind me of Kaa the snake in “The Jungle Book”.